The biggest NASCAR news last week came off the racetrack with an announcement Lowe’s will leave the sport at the end of this season. It’s a name brand that’s been synonymous with success in the Monster Energy NASCAR Cup Series. 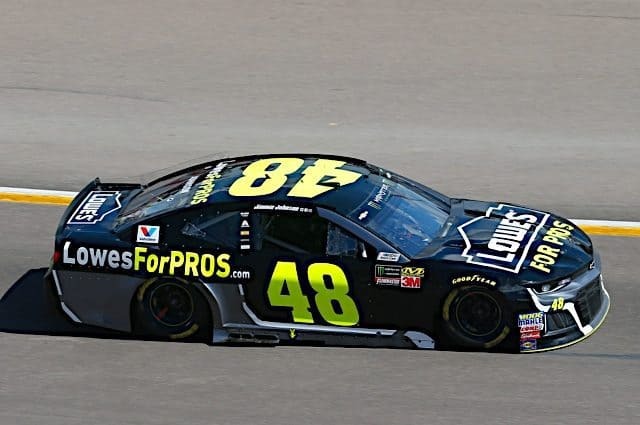 Involved at the Cup level for two decades, they’ve been primary sponsor of seven-time champion Jimmie Johnson and the Hendrick Motorsports No. 48 Chevy since the start of Johnson’s Cup ride in late 2001. In 584 (and counting) races of an illustrious career, Johnson has won 83 times, sixth on the all-time wins list. That’s just one behind Bobby Allison and Darrell Waltrip (84 wins apiece) and ten behind his longtime friend and colleague Jeff Gordon. Now obviously, I’m not privy to the internal workings at the home improvement chain. But if I was reading in between the lines, I would say the issue is value. Lowe’s likely pays 20 million a year (including activation, hospitality etc.) minimum for the sponsorship of Johnson’s ride. In the current NASCAR world, one with constantly hemorrhaging TV and at-track attendance figures, these numbers simply don’t add up. BOWLES: DID LOSS OF NASCAR COMPETITION CAUSE LOWE’S TO BAIL? “Investing in other strategic initiatives” is essentially a polite way to put that Lowe’s wants out. And on one level, it’s hard to argue with the logic. The cost of NASCAR sponsorships is high, especially given other opportunities on the table. Target, for example, decided to focus on soccer over NASCAR in part because there’s a much lower point of entry and arguably a larger long-term upside. Of course, some of these choices are cyclical. Sponsors – even the most loyal — come and go while marketing budgets swing wildly year-to-year. Gone are the days when a marketing department at a big company can safely project five years out. In this day and age, five days can feel like an eternity. 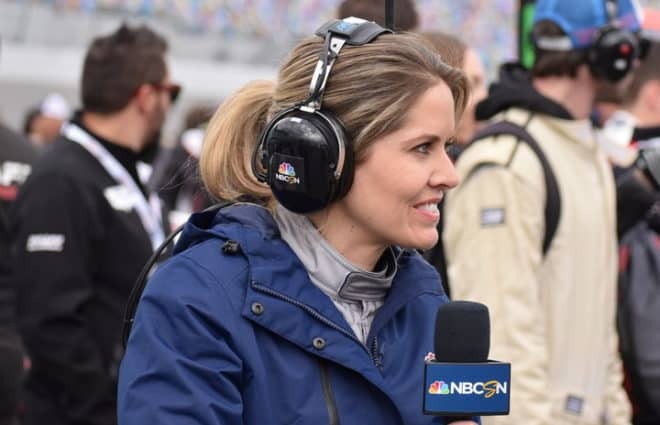 Committing significant dollars to NASCAR is a tough business decision in this fast-changing economic environment in a way it never was ten years ago. But the real question is whether this decision by Lowe’s is a harbinger of bigger moves to come? Perhaps, truth be told. Moving forward, full season sponsorships are going to be near impossible to secure. That means race team marketing departments will have to get even more creative in their search for brands to adorn cars and fill schedules. 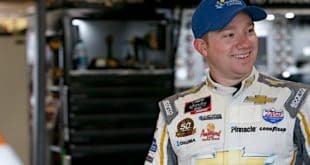 I’d imagine filling Johnson’s dance card for 2019 is the absolute top priority at HMS (away from on-track activities). But as we saw with Matt Kenseth, past success is no guarantee in the boardroom for a 40-something driver. It will be interesting to see how quickly they can tie something up. As always, with NASCAR, it’s a case of watch this space. The search for Johnson could form a baseline for how sponsorship transforms in the sport going forward. There are few sure things in life and arguably even fewer in NASCAR. But if there’s one thing you can bank on, it would be great racing at Martinsville Speedway. The smallest, slowest, flattest track on the circuit at just a shade over a half mile (0.526) almost never disappoints. 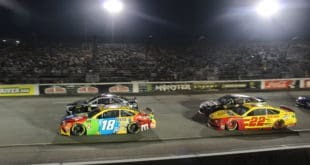 The paperclip-shaped circuit has been on the schedule since race number six (of eight) of the inaugural 1949 season, a contest won by none other than NASCAR Hall of Famer Red Byron. This weekend’s 500-lapper will be the 139th time Cup cars have raced at Martinsville and, as is the case most weeks, Johnson leads the way with an incredible nine wins. When the clock strikes twelve, it must sure get loud at the Johnson residence. Denny Hamlin has a fairly impressive five victories at the track. Kyle and Kurt Busch both have a pair while Kevin Harvick, Brad Keselowski and Ryan Newman have a win apiece. All told, only eight drivers in the current field have won at the iconic circuit. For me, Martinsville has always been a race I circle on the calendar each season. This Sunday is no different. Bring on the paperclip and someone please send a hot dog or two my way. This Sunday also sees the first race of the 2018 Formula One season. For the eighth year in a row, action gets underway at Albert Park Grand Prix Circuit in Melbourne, Australia. The 21-race F1 schedule runs through November 25 with the final race at the Yas Marina Circuit in Abu Dhabi. The powerhouse Mercedes team has won four straight titles: three for Lewis Hamilton (2014, 2015 and 2017) and one for Nico Rosberg in 2016, who promptly retired. Alongside the reigning champ Hamilton for a second season will be the Finn, Valtteri Bottas, who won three times in 2017 – the first victories of his five-year, 97-race career. Two teams will challenge the Mercedes dominance. The Ferraris of four-time champion Sebastien Vettel and 2007 champion Kimi Raikkonen ran Mercedes close in 2017 and were it not for a series of late-season engine issues, the title fight would have been a lot closer. However, the outlier team might just be Red Bull and drivers Max Verstappen and Daniel Ricciardo. In preseason testing, they looked closer to Mercedes but the real truth will be shown on the streets of Albert Park this Sunday. Welcome back to one of the real characters of the NASCAR world: Mr. Landon Cassill. 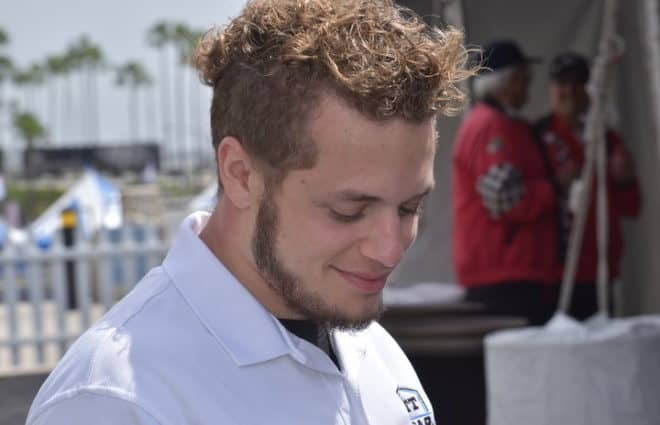 He’ll be replacing Jeffrey Earnhardt in the No. 00 StarCom Racing ride. 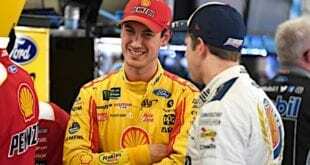 Cassill completed a full season for Front Row Motorsports last season but was bumped by Michael McDowell heading into 2018. McDowell, of course, was pushed out by Kasey Kahne at the No. 95 of Leavine Family Racing (talk about musical racing chairs). 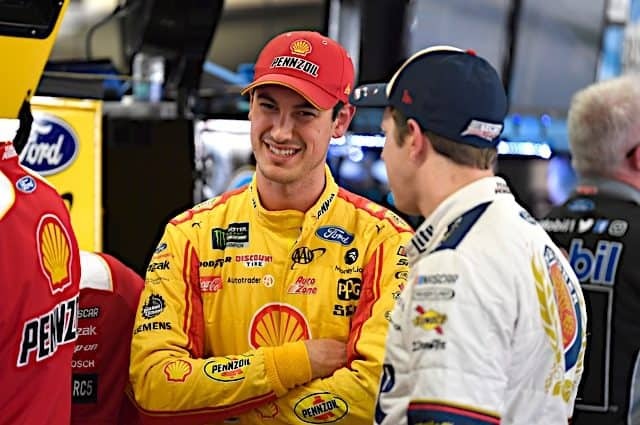 Cassill is slated to compete in the next two races (Martinsville Speedway & Texas Motor Speedway) for StarCom and then? Who knows. Over the course of an eight-year, 259-race MENCS career, Cassill has a best finish of fourth at Talladega Superspeedway back in 2014. One of the sport’s perennial underdogs will try and add another chapter with a new, fledgling program. Here’s hoping these next two races see Cassill parlay the short-term opportunity across the course of the 2018 calendar. Either way, his Twitter feed should be fun to watch. 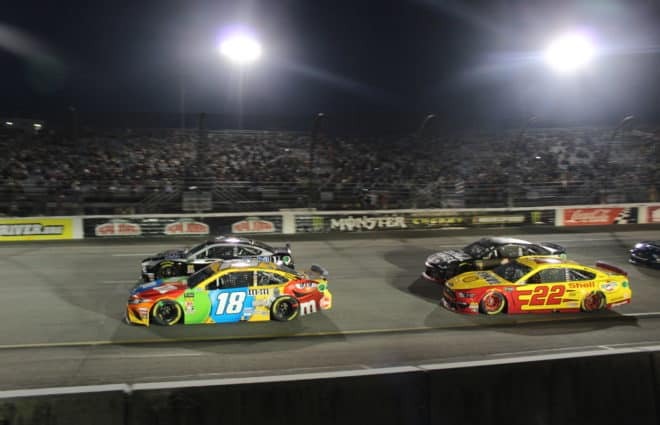 For the fifth straight week in 2018, NASCAR TV ratings dropped compared to last year’s numbers (a 2.4 at Fontana). Sadly, this trend isn’t anything other than a familiar story. In the last few years, the sport’s TV viewing audience has been significantly reduced and there’s still no end in sight to the drop. Truth be told all sports, even the NFL, have suffered. But at some point, the decline has to be arrested, right? Judging by the early evidence this season, we’re still not there yet. How low it might go remains to be seen…. 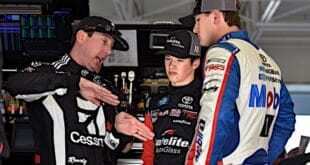 You know Matt Kenseth gets the “wait a minute” boot from JGR and Erik Jones comes ringing in! Matt being a former one time champion at that. Is it conceivable that some young gun wet behind the ears brings money to hand a seven time champion Jimmie Johnson the “wait a minute” boot as well? Earlier this year, Lowe’s laid off 2,400 full-time employees, mostly at the store level, as part of an overhaul of its staffing model. The next month, the company laid off more than 500 full-time corporate employees, including 430 in its headquarters in Mooresville and 70 support staffers in Wilkesboro, as a way to boost profitability. Last October, the retailer also laid off about 95 people in its information technology department. Lowe’s, the nation’s second biggest home improvement retailer behind Home Depot, has struggled to improve its profitability as customer traffic slowed in several months last year. Definitely looking forward to the start of the F1 season this weekend. Is Mercedes as strong as they seem to be? Does Ferrari’s pace on soft tires mean anything? And whats all that oil smoke from the Ferrari’s on startup signify? As far as nascar ratings, until there is a something consistently move attractive on weekends the networks have no choice. But I wouldnt be expecting a better contract if i were the folks in Daytona Beach. Not a fan of Jimmie and Chadly, hell no. However a long time sponsor such as LOWES, A VERY GOOD SPONSOR at that, should give Brian a huge “AH HA” moment. NOPE, doesn’t seem to have happened yet.